Once a week FareShare chefs provide a special lunch for women at McAuley House, Victoria’s first purpose built accommodation for women who are homeless. 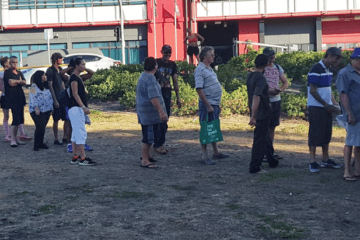 The community meal for the women, many of whom have also experienced family violence and mental illness, is a weekly event at McAuley House, which opened last year in Footscray. 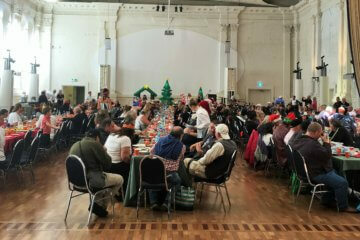 At a recent lunch, residents described the FareShare food as “absolutely delicious” and “beautiful”. “Community lunch is always a big one.” says Amy Sattler, Facilitator of McAuley’s Food for My Life nutrition and cooking program. “It’s one opportunity a week to be socially engaged and to eat a nutritious meal. It’s particularly important for our outreach women who are in transitional or public housing. The community lunches are served in a welcoming dining space with sweeping views of Melbourne. 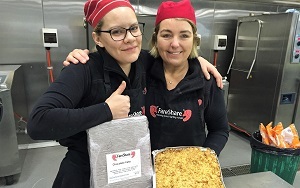 Roast meat and vegetables, salads and dessert make up a typical lunch with ingredients supplied by FareShare and desserts prepared in our kitchen. “The women love the FareShare desserts. They’re a real highlight,” says Amy. Food for My Life aims to nurture independence and equip the women for life after McAuley House. 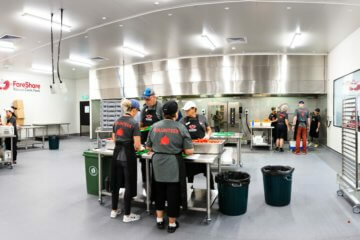 And with two kitchens in the new building, many are cooking for themselves or with some support. Only a handful still need meals cooked for them. In addition to providing 25 rooms for medium-term accommodation, McAuley House acts as a hub for community services that support over 100 women each year.